Continuing our check in with the 2017 Holman Prize winners I speak with Ahmet Ustenel. When we last spoke with him he was preparing to kayak the Bosphorus Strait. Take a listen to hear all about the technology developed to help him independently navigate his kayak from Turkey to Asia. We’ll learn about the pressures, lessons learned and hear from his team. As you’ll hear in this episode, this trip represents much more than a kayak adventure… it goes beyond the sea! Apple Podcast, Google Podcast Sound Cloud, Stitcher, Tune In Radio or wherever you get podcasts. Hmm, I think I see a few new faces out there today? Ok, this is pre-recorded radio so I can’t see faces. Oh wait , I’m blind so I can’t see faces! If you are new to the podcast, welcome. Reid My Mind Radio is not only my space to demonstrate my corny humor, but it’s also a place to highlight topics and people I find compelling. Occasionally, I share stories from my experience adjusting to blindness as an adult. This is a welcoming space where I hope every episode provides a bit of thought, empowerment and a hint of entertainment. Today, we’re continuing with our updates from the 2017 Holman Prize winners. Rather than doing that this week I thought I’d share a poem. Now, I used to write rhymes as a teenage but these were raps for the lunch room. But after a bit of inspiration, I figured, this is a safe space so I’ll share. over my theme music Boo! Ahmet Ustenel, the Blind captain is back! Here’s how he introduced himself in the original 2017 episode. I am originally from Turkey. I have been in the US for about 11 years now. In my free time I like water sports. I like swimming, kayaking, fishing, sailing. I’m totally blind since the age of two and a half or three due to Retinoblastoma. I’m also a Retinoblastoma survivor Sir. While we share the same childhood eye cancer, our experiences were different. Ahmet lost his eyes around 3 years old. I lost one as a child and the other as an adult due to a second cancer. When I brought you his story last year, he was in the early stages of preparing to Kayak the Bosphorous Straits. ##Istanbul is a city on both continents. And we have this Bosporus Strait that separates the city into two different parts. And the area I’m going to cross is about three, three and a half miles which is not a big physical challenge, but it has heavy traffic. A lot of ships like tankers, containers, fishing boats, tourist boats, sailing boats you know all kinds of stuff. I’m not worried about the physical challenge – I can paddle you know three miles right now, no big deal. Being an expert using the technology is the key because I don’t want to have hesitation right in the middle of the shipping channel you know. That could be fatal. One piece of off the shelf technology or downloadable app wouldn’t do the full job for Ahmet’s project. Ahmet had to be more than head navigator of his kayak and provide the leadership enabling his team to accomplish the goal. The physical part – I have to go train and find people to train with and then I need to figure out my logistics. Like even simple things like how to carry my kayak. I have the technology part and I have to find people to work on those technologies. In addition to all of that, this is an international project so there are additional logistics to coordinate. But lots of things can force a change to any plan. Especially technology. Something works great in a nice dry environment, but when you put it on a kayak (laughs) it gets Corroded and you need to eliminate maybe external batteries or external cables. We needed to redesign. there was a lot of trial and errors until pretty much a couple of weeks before the crossing. While managing all of the moving parts and people associated with this project, Ahmet continued working full time as a Special Education Teacher. One of those people heavily invested in the project is Marty Stone. An AT&T project manager who was creating a device to help Ahmet navigate his course. I’m just one of those people who likes tinkering with things. I caught up with Marty to hear his thoughts on the project. Well you know things of course always go slowly. We nearly ran out of time but we got some really nice help from AT&T. What’s known as the Internet of Things Foundry. There’s several of them. This one was in Houston Texas. Marty was actually in Turkey. Now that’s a true indication of what this project means to Marty. After working throughout the year, traveling to Turkey to further show his support for Ahmet and the project. I got to meet Ahmet for the first time. Quite an emotional experience! Ahmet along with his family and team in Turkey, preparing to set off on his journey across the Bosphorous. Ahmet steers us through the big day. First of all, my idea was crossing on the 22nd without telling the Coast Guard, without telling the Traffic Control. Laughing… Editor’s note — in full support of this idea! Quietly with just one support kayak in case something goes wrong my coach will be following me. But then the word got out and a lot of people heard about it . The Coast Guard heard, the traffic Control heard about it and then they said oh, no no no no you cannot do that. The Coast Guard now aware of our blind pirate Ahmet’s intentions decided to slow traffic and give him a window of time to make the crossing – 90 minutes to be exact plus they changed the launch date to the 21st. I said ok, you know we’re going to do it officially. That’s cool! Then in the morning of crossing I was at the Marina just you know getting ready to prepare. We were having tea. We were not even close to our kayaks yet and I get a radio message. I was like woh! I was expecting an 11 o’clock start and I got the message at 9. Not only rushing through the process of assembling the kayak, Ahmet had to speed up his mental preparation. And then there’s all of the technology. Nothing ever happens as you expect or as you planned. Marty should know, he’s a project manager after all. Unfortunately, at the last minute we had a hardware failure. on the system. It was the keypad . So he was no longer able to enter any commands. We had recorded a trip the day before and we were getting ready for him to play that trip back and basically follow the course but we couldn’t get the system to take a command because the keyboard had shorted out. Thankfully there was a backup system. Not what we worked so hard to have him use but it was a backup system that worked nonetheless. So very grateful for that. We return to Ahmet in his kayak ready to set sail and cross over to Asia. Sounds like a simple question, but for Ahmet it symbolized the pressure that accumulated throughout the process. I felt so much pressure. People were focusing so much on the crossing, but actually it was a lot more than that. The background of the project was a yearlong even longer than that. All people see is can you do it or not. So many people actually worked on this. It was a team effort a team project. So many layers and so many people and so many organizations were involved. And I felt like I really don’t want to disappoint people. People traveled from US. they came to Turkey to support. I had a lot of people in Turkey as well. If I fail was going to try it again anyway but I felt like if I failed all these people will be so disappointed or they will feel like they failed. After a year of planning, now sitting in the kayak with all of the people there to support. Even reporters and others from the media are there to find out whether he can make it to the other side. Now, the extra pressure of only having a half hour to complete what he estimates is a 90 minute trip. I think that was the fastest I paddled in my life. I was like woh that’s it. It was only like 20 minutes. Yeh, I was moving man. Adrenaline rush. He just about doubled his average kayaking speed from 4 or 5 miles an hour to about 7 or 8. On top of that, he was dealing with boats getting too close taking pictures along with spying drones hovering above. the Holman Prize is after all, all about adventure. How much adventure is in everything going according to plan. Yes, he completed the trip across the Bosphorous, but there are other measures of success. Like, the level of enthusiasm and commitment from his team. Like Marty Stone. He had a lot of pressure, just talking to him. He’s a super hero man he really is. And I’ve talked to him I said yes, crossing the Bosphorous going from Asia to Europe, wow, that was the main deal. But everything you’ve done to get to that point . You know you’re an amazing project manager I told him, you’re an amazing inspiration. I know that word inspiration, for those in the disability community can be a sort of trigger. Often misused towards a person with a disability. As in exclaiming a blind person is amazing for completing the most trivial task. These sort of praises are often more indicative of the other persons low expectations. However , Marty and Ahmet have been working together for over a year. Marty’s compliments appear to be based on Ahmet’s actual work. Think of all the things you had to do in order to pull this off and then you pulled it off. I said you got some real important knowledge here that no one else has. Along with improving his physical and technical kayaking skills, the most important success metrics are probably those things that Ahmet himself gained from the experience. I learned about technology. I learned about myself. What did you learn about yourself.? When I have a goal, a big goal, I work better, I work hard. But if I just have some idea in my mind with no clear goals and objectives then I go off track. I’m 38 years old I had a lot of ideas a lot of projects but sometimes I didn’t have enough motivation to start. But now I realize if I started then like 10 15 years ago most of them would be done by now and I felt like man you know I lost time but it’s not too late. I can still do stuff. Laughs. Yeah, we have time man! When you have something in your mind, don’t lose time. That’s my new approach. Just start somewhere and it’s going to happen. Your skill set from this has probably greatly improved. Project management, you’re leading teams . Do you see any relationship to your career and then also I have a feeling you’re going to be a little rougher on your students. Laughs! I always seen myself as a team member. Whenever I worked on a project I was a good team member, but I haven’t seen myself usually as a leader in the team. But after this project actually I was coordinating a lot of stuff. I was managing a lot of stuff and now I realize actually I might have some leadership skills as well. That’s a very important thing to know about yourself. I feel like I can take more responsibilities in the school district now or do some other projects with different organizations. In terms of career, I think I will be teaching for a long time. I like teaching But in addition to teaching I might take some different roles in the district or in some different organizations in the Bay area. Maybe I might do some recreational stuff with some blindness organizations. Expectations are high. There’s no slacking for students. After managing all of the moving parts of the project, the pressure and last minute changes I wondered if Ahmet had plans for more adventures. It was a life changing event for me this year. I got the bug now. I cannot stop now. I cannot stop. I have to think about my next project. That bug apparently, is contagious. Ahmet says Marty too was bit! In fact, when I reached out to Marty he was working on hardware changes improving on the original design. In my first conversation with Ahmet, prior to him taking on this adventure, I asked him why. Everything could be adapted. Everything could be more accessible, that’s what I want to show. I don’t want it to be a success story of one person … he’s blind but he did that, he did this. It doesn’t mean anything you know one person did this. He had a network of people, all in different locations, exchanging information with a shared goal. Complete strangers can get together and do something amazing together. Volunteers, nobody got paid fr this. We put our heart and soul into this to help out another human being. If human beings can do stuff like that, why is it that we still have people being separated at the border and we’re not able to treat our neighbors with respect? The following audio clips taken from news items fade in from left and right. d. The 11 Jewish worshipers killed by a Nazi White Nationalist Terrorist in Pittsburgh. From a species standpoint, we’re capable of so much wonderful greatness and yet we’re also just able to be just really horrible nasty creatures. I still marvel in the fact that a whole group of people who didn’t know each other pulled together and made something really beautiful happen for another person. And if we can do that, hell we should be able to straighten out our problems. Ahmet’s journey offers a chance to represent more than its face value for anyone interested enough to see it. He created a proof of concept. providing the power for a self-navigating water vessel. Expanding on methods for blind and low vision people to independently participate in activities like kayaking, rowing, canoeing. Now Ahmet wants to share all of his accumulated kayaking knowledge here in the states and Turkey. Just introduce kayaking to blind people. Independent kayaking using the devices we made. The Blind Captain, baby! Yeah, alright! How could you not be happy for someone who becomes empowered and wants to share that with others. I’m reminded of our first conversation in 2017 when Ahmet described his relationship with the water. I always loved the water, it’s my happy place. It’s the place I feel good about myself I feel free. Audio: A very calm kayak moving through the water. Fades into sounds of 45 at a rally, news commentators recapping the deaths and current events. Fades back to the peaceful sounds of the kayak on the water. Free! That does sound good! 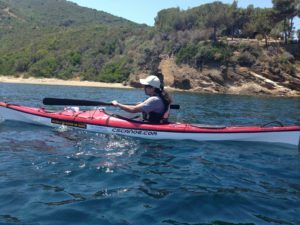 Ahmet’s planning to take a month and camp and kayak the coast of Turkey’s Black Sea. He’s not sailing off into the sunset just yet. He and his journey are part of a documentary currently in production. And he knows he has to come back to the family – the Reid My Mind Radio family and let us know more when the time is right. You know the time is always right to subscribe to this podcast. You can do that on Apple Podcast, Google Podcast, Sound Cloud, Stitcher, Tune In Radio or your favorite podcast app. All you have to do is search for Reid My Mind Radio. That’s R to the E I D! Don’t miss the next episode where we catch up with our favorite Social Entrepreneur, Bee Keeper and honey farmer Mr. Ojok Simon. Until next time where I once again strive to answer the question that started this podcast in 2014. Can you do it or not!